How to Prototype in Frontify Workspace. 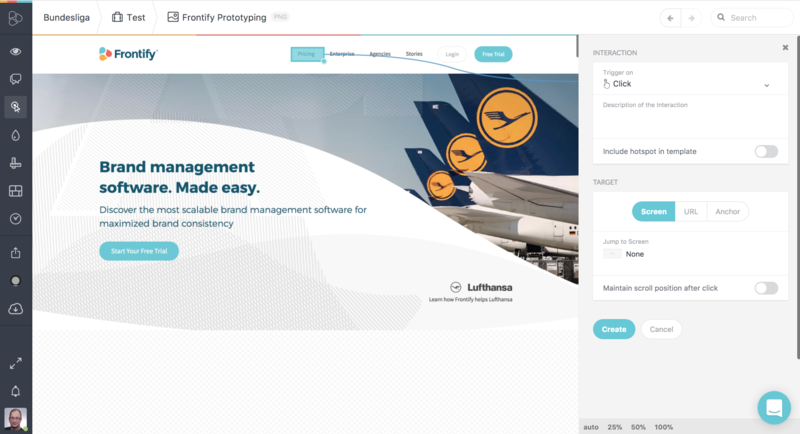 You want to do prototyping of your webpage project. 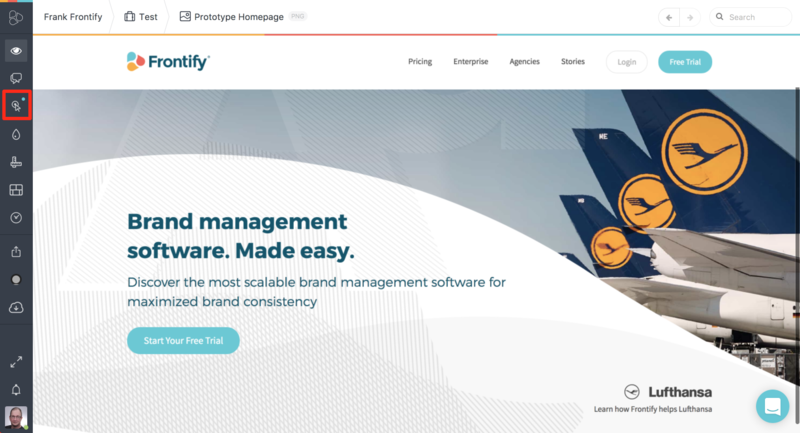 With Frontify you can exactly do that. It`s so easy. After you finished your prototyping project, you are able to share it with others. In this article, I will show you how to do that. Open the image by clicking on it. Press the Prototyping Button in the Power Bar. Now you have the Prototyping Box on the right side. Here you can set a fixed Header and or Footer. Set your Interactions. Or create/choose a template. 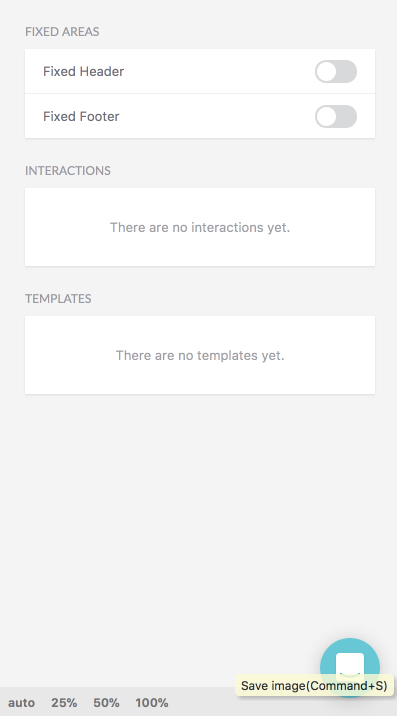 In our case, we want to show how a click is working in the upper menu. For example. What will happen if I click "Pricing" in the Menu? Click & Drag, to create a Hotspot. Cool, we created our first Hotspot. Within the right box, we can set, that the Hotspot is a "click". 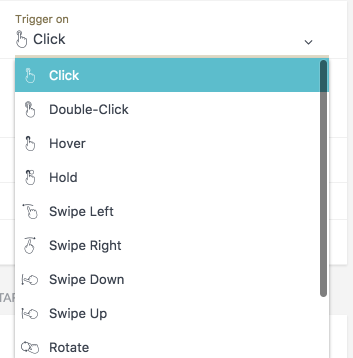 Also, we can now target what the click is showing next. 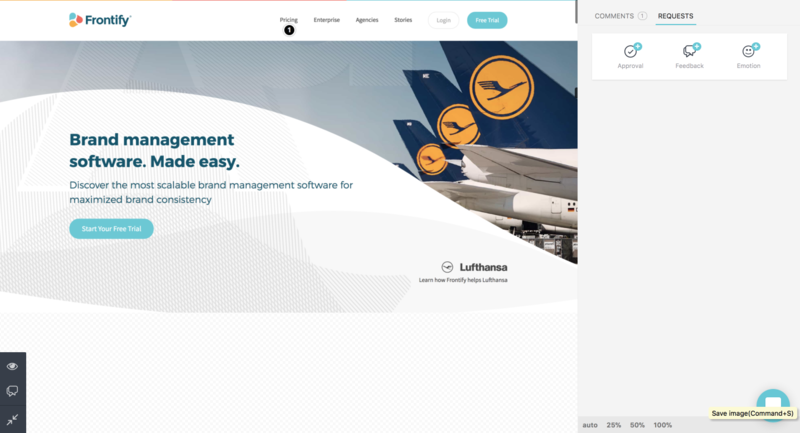 In our example, the "Pricing" navigation should bring up the "Pricing" page. 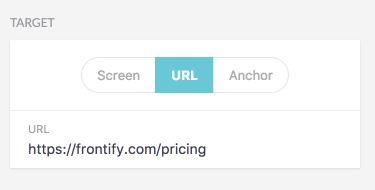 Lets set the "Pricing" URL as a target. Do you want to test, if the click is working correctly? Click the "View" Button on the Power Bar. Click on "Pricing" in the upper navigation. If we set it up correctly, then the "Pricing" page comes up now. Let`s show it to our colleagues and get Feedback. Press the "Share" button in the Power Bar. Turn the switcher on under "Prototyping Sharing". Now you can click on "Copy Link" and send it to your colleagues. If they open the link the can see the screen with all the created "Hot Spots". 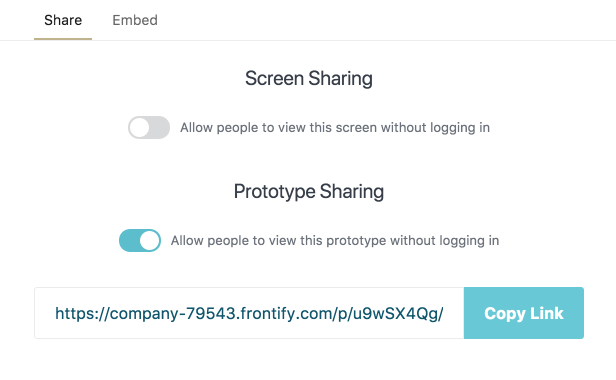 If your colleague is a Team Member with a Frontify account, he can give a comment and/or "Request" a Feedback, Approval or give an emotion. Best is now that you try it by yourself. If you have a question, feel free to contact me directly over the Chat in your Frontify Account. Or write an email to our support.